Fully updated, this comprehensive and engaging introduction to the sociology of the family offers cross-cultural and historical coverage of a timely topic. For this new edition the authors have added a glossary, expanded and revised many of the chapters, and included a short outline at the< br> beginning of each chapter to provide an overview of material covered. An entirely new section on adoption has been added, and the chapter on dual career families greatly expanded. - Publisher For the seventh edition of this popular work, Gerald Leslie and Sheila Korman have updated their research and added a glossary which will be helpful to undergraduates. In addition to expanding and revising many of the chapters, the authors have included a short outline at the beginning of each chapter so as to provide a better overview of the material being covered. The chapter concerning dual career families has been considerably extended and a new chapter on adoption has been added. 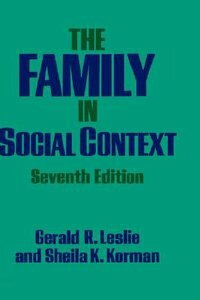 About "Family in Social Context"
For the seventh edition of this popular work, Gerald Leslie and Sheila Korman have updated their research and added a glossary which will be helpful to undergraduates. In addition to expanding and revising many of the chapters, the authors have included a short outline at the beginning of each chapter so as to provide a better overview of the material being covered. The chapter concerning dual career families has been considerably extended and a new chapter on adoption has been added.